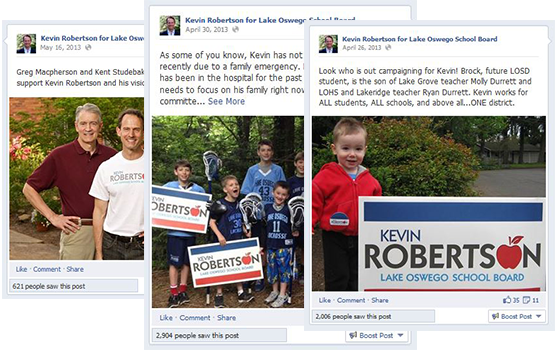 Fish Marketing’s first foray into politics centered on candidate Kevin Robertson’s run for the Lake Oswego School Board. A late entry into the race, Kevin needed full campaign marketing materials in a relatively short amount of time. We quickly got to work, creating a full suite of campaign materials. Despite the late start and a family illness that limited his ability to stay on the campaign trail, the candidate was able to close the huge gap that existed at the start of the race. The first assignment for Fish Marketing was creating an appealing logo for Kevin. A clean, simple design and bold colors spoke to the candidate’s maturity and long experience with local politics. All the subsequent parts of the campaign were designed to be consistent with the initial branding elements. Fish Marketing worked with Kevin Robertson to design a distinctive website that highlighted his extensive experience in comparison to his opponent. The site was simple and easy to navigate, so viewers could respond by donating, volunteering or connecting with Kevin for more information. 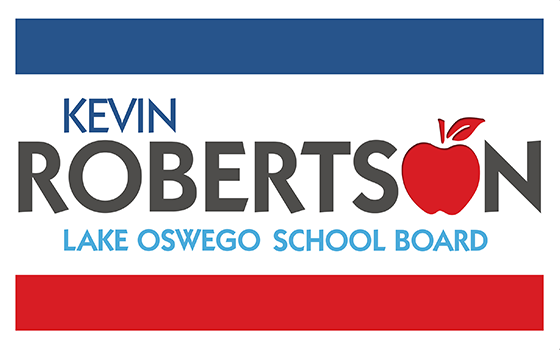 The Robertson for School Board Facebook page we created kept voters up to date on the latest information, regularly focusing on Kevin’s growing list of supporters. 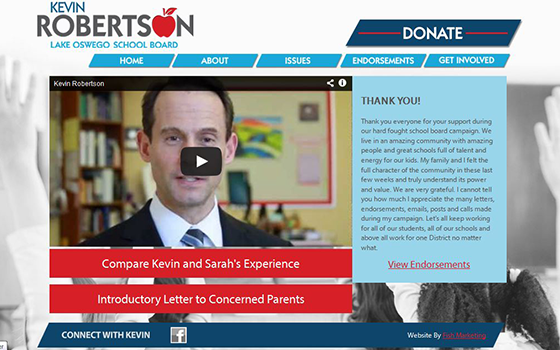 We created an email template, which the Robertson campaign used on a regular basis. 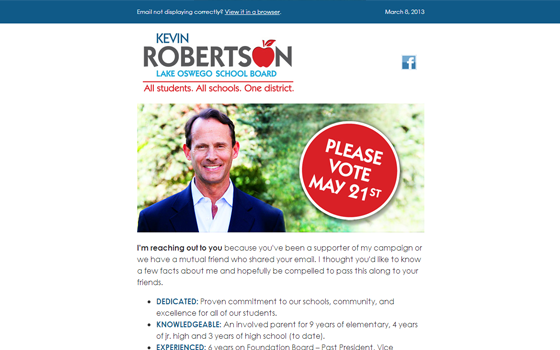 The design and tone of the emails had a personal touch, as if Kevin were speaking directly to the voters, telling his story about why he was running for the school board and emphasizing his experience and dedication to the schools. Other emails reminded voters about important dates – town hall meetings, appearances, and most importantly, the upcoming election day. 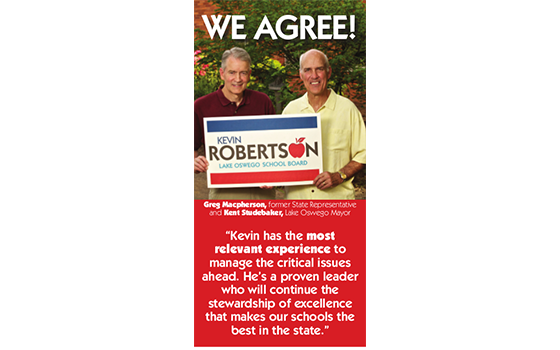 In all the print advertising we created, the common theme was Kevin Robertson’s extensive experience, which made him uniquely qualified to serve on the school board. This highlight of the advertising campaign was convincing the two former rivals for the Lake Oswego mayor’s race to appear together in ads in support of Kevin – a major political victory!